The Almond Breeze Breezey Masters Grand Final will take place on 13 November from 6pm to 8pm at The Grounds of Alexandria in Sydney. Breezey Masters competitions were held in six states across Australia, as well as in New Zealand, South Africa, Japan and the United Kingdom in the lead up to the international final. “We’ve seen some incredible talent this year, both in Australian cities and globally, and we are so excited to be once again advocating for a group of exceptional baristas who are helping us push the industry forward,” says Mike McNulty, Country Director for Almond Breeze Australia and New Zealand. Australian competitors in the Breezey Masters Grand Final include Sarah Jin of Extraction Artisan in Queensland, Vicky Chuaybamrung of Darkstar Coffee in Western Australia, Alex Whigham of My Kingdom for a Horse in South Australia, Vincent Do of The Grounds of Alexandria in New South Wales, Matt Sharp of Highroad/Ona Coffee in the Australian Capital Territory, and Chon Iat Lao of Ael in Victoria. International competitors include New Zealand’s Logan Collinge of Mojo Coffee, Leo Li of Atomic Coffee Roasters, and Chamnan Ly of Tasteful Bakehouse; South Africa’s Idricia Nakahosa of Truth Coffee Company; Japan’s Takehiro Okudaira of Caferista; and the UK’s Ben Lewis of Coffee Lab. 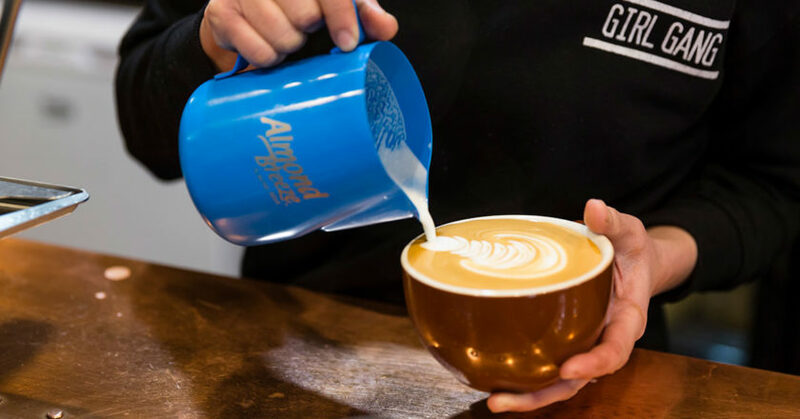 Almond Breeze says the Breezey Masters format is simple but challenging, with competitors tasked to present six cups in 10 minutes using set latte art patterns and free pours. Judges then evaluate each cup throughout the competition based on complexity and clarity. As part of the winning prize, the crowned 2018 Grand Breezey Master will travel to either the UK to experience the London Coffee Festival or to North America for the Specialty Coffee Expo in 2019. The winner will also be honoured in Almond Breeze’s Barista Benchmark series that features exceptional baristas on the side of the Almond Breeze Barista Blend pack, which is distributed to cafés across Australia. Almond Breeze recently redesigned the Barista Blend’s packaging, following consultation with baristas and customers about what they found the most visually appealing. Almond Breeze says the dark blue, sleeker-looking Barista Blend packaging complements Australian café culture with its minimalistic design and simple clean aesthetic. Earlier this year, Almond Breeze Barista Blend also launched BaristasforBaristas.com, a website created to ensure baristas and those in the coffee industry are listened to and supported in reaching their goals so that the Australian coffee scene can continue to thrive.